The beautiful city of Milan is an industrial and commercial centre situated in northern Italy and is the regional capital of Lombardy. It has a large historic city centre surrounded by numerous suburbs which are served by a comprehensive tram, bus, trolleybus and Metro service. Milan is only some 20 km from Lake Como and the other Italian lakes, so makes a superb destination for the lover of transport or for those just seeking a relaxing holiday! All public transport in Milan is run by ATM (Azienda Trasporti Milanesi). The current tram fleet is made up of trams covering a period of almost 90 years. The Peter Witt designed tramcars were built by six different manufactures, Breda being one of them. Known as the ATM Class 1500, they were first introduced in 1928 and still operate today, most having been refurbished, but to their original style. The ATM Class 4600 and 4700 were built in the 1950s by OM Stanga and Breda. The ATM Class 4900 were built in the 1970s either by Fiat or OM Stanga. This class are currently being rebuilt to include air conditioning, new windows, floors and seats and are in a smart stylish livery, which you will see on this programme. They are all high floor trams with limited accessibility as they were built as light rail vehicles for future light rail schemes, but these schemes were never built. Modern low floor trams are ATM Class 7000 Adtranz Eurotram and the ATM Class 7100, 7500 and 7600, which are Ansaldobreda Sirio cars of different lengths. On this second programme we take a look at the trolleybuses. There are currently four routes, which operate to the eastern side of the city. The trolleybuses seen on this programme are: Socimi 8834 (100 series fleet numbers), Bredabus F04 (200 series), CAM Busotto MAN NGT 204F (300 series), Irisbus Cristalis (400 series) and Van Hool AG300T (700 series). All are articulated and are 18 metres in length. Our filming starts at the junction of XXII Marzo Viale Corsica and Viale Umbria. Here we see both the trams and trolleybuses crossing the junction. We then board trolleybus 119 for the journey to Piazzale Lodi for more filming. We continue on 739 and 711 to the Piazza Graziadio Isaia Ascoli for more action. Our next journey is on board 705 to the busy junction of Via Degli Imbriani and Piazza Giovanni Bausan. 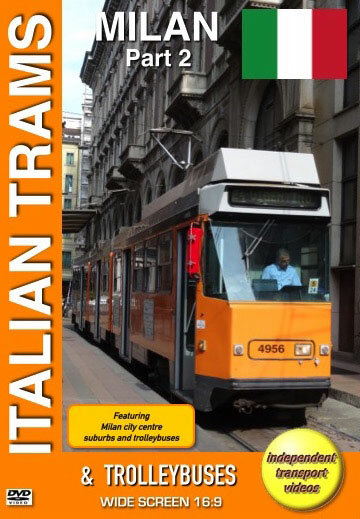 Our cameras then take rides on trams 4714, 1688 and 1670 to Piazza Castello with lots of filming in-between! With more action recorded in the city centre we travel on tram 7515 to Piazza Napoli and Via Carlo Troya to see more tram and trolleybus action and then return to the city centre on tram 7632. We now travel out to the terminus of tram line 27 on board rebuilt Fiat Ferroviaria tram 4943. You will see the excellent job that has been done on these forty year old trams making them feel brand new! Once back in the city centre we film the busy streets of Piazza Cordusio, Via Dante and Via Torino. As on Part 1, there are subtitles with details of each location and vehicle type. We hope you have enjoyed your journey to sample the delights of the beautiful city of Milan. Duration : 78 minutes (approx).